When we think of car tech, our minds immediately see the dashboard or infotainment system, maybe even the drivetrain. But what if there were something more? Something not necessarily considered an electronic? That’s where UIltrafabrics comes in – pioneers in the polyurethane synthetic leather industry. They manufacture 100% PVC-free, sustainable products for our cars, furniture, boats – anything. So you’re asking yourself, “What does this have to do with technology?” Good question. Unlike other polyurethanes, leathers, or vinyls, Ultrafabrics’ products are manufactured using their unique Takumi technology, enhancing performance and durability. It begins with the superior foundation of reinforced rayon fibers for stability and performance. An added layer of microfoam provides increased comfort, reanimating that oh-so-great feeling of sitting in your recliner at home after a long day of work. Who wouldn’t want that luxury on their commute back home? In addition to the added microfoam and rayon fibers, there is a topskin layer featuring polycarbonate resins for maximum hydrolysis resistance, meaning it won’t break down or delaminate over time unlike many plastics or inferior polyurethanes. But what makes these materials even more technologically advanced is their protective surface layer. This layer protects against stains and harmful effects of everyday cleaners. It also adds that extra durability and ease of care, which in turn, makes life easier for you. The durability is something that really captured my attention about these products from Ultrafabrics – so let’s dig a little deeper into that. With their high abrasion ratings, you don’t have to worry about cracking or replacing the product as quickly as you would with leather or vinyl. You’ll be comfortable letting your dog or child run all over the back seats. 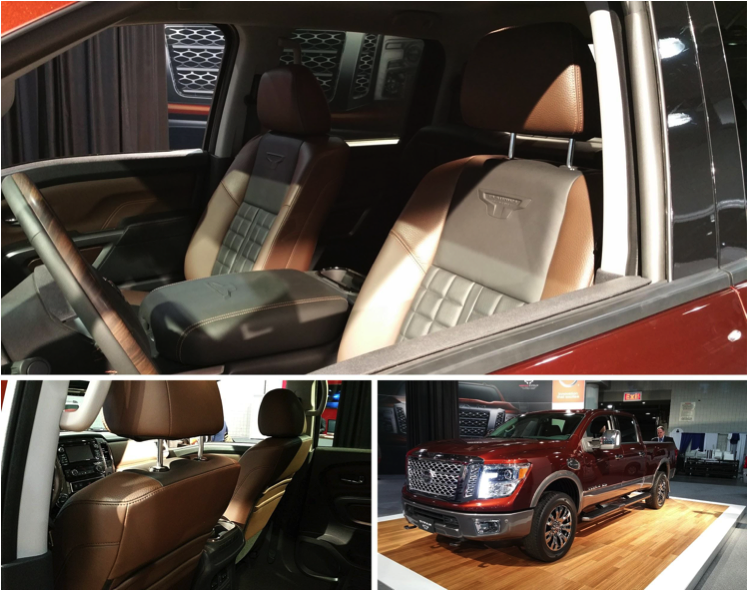 While at the 2015 New York Auto Show, I was able to interact with their product in the all-new Nissan Titan. That first touch made me fall in love. It was different than anything I had felt before and couldn’t believe it wasn’t leather. I knew what had to be done – sell my Jeep and buy the 2016 Titan. But once I cleared my head from the overwhelming softness, I realized I can just buy the fabric from a distributor and have my Jeep reupholstered – just what I needed. So let’s recap: 100% PVC-free, sustainable, durable, high hydrolysis resistance, crack and stain resistant, no toxic chemicals, easy to clean with rubbing alcohol (yes, you can use rubbing alcohol), and extremely soft to the touch – what’s not to love?